It could’ve been any type of pasta but that’s what I have at the moment. Works for me, though! I like the thickness of the campanelle which gives it a meaty texture. The ridges are good for holding thick sauces, actually. But I wanted something simple right now, so no sauces this time. I had some leftover fresh mozzarella so I diced it up and added it but you really don’t need it. Just some grated parmesan and you’re good to go. So easy to make, too. Ready in 15 minutes. Cook pasta to al dente. Meanwhile, in a medium-low heated large pan, sweat garlic in EVOO for a few minutes until fragrant but not browned. Add cooked pasta, chopped parsley and fresh cracked pepper. Toss well. 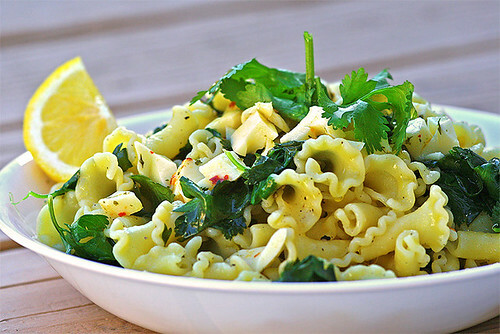 Squirt some lemon juice and serve on pasta bowls. Garnish with grated parmesan, a lemon wedge and a drizzle of fresh olive oil. The last meatloaf I made was an Italian-inspired one and I haven’t made another, since. This time, I wanted to try something different. Maybe even get a little closer to home. And since I live in Wyoming, I thought I’d go local and give Chugwater Chili a whirl and see how it goes on a meatloaf recipe. And while I’m at it, I thought, I might as well go all out with the kick by adding jalapeno peppers to the mix. I would’ve used ground beef but I happened to have a thing of ground turkey in the fridge, so that’s what I used. Smart Ground or something similar would be a good vegetarian alternative, as well. I also had some leftover cilantro leaves so I just threw it on the mash and it worked out great. By the way, the radish slices gave it a nice cool break from the spiciness of the dish. Outstanding, I say! Give it a try already. Preheat oven to 350F. In a large mixing bowl, combine all meatloaf ingredients together and mix well using your hands. Take note that Chugwater Chili Powder is already salted. If the chili powder you’re using doesn’t have salt in it, go ahead and add some, otherwise, beware of over salting. Now, make the glaze by combining all the glaze ingredients together in a small bowl and mixing well. 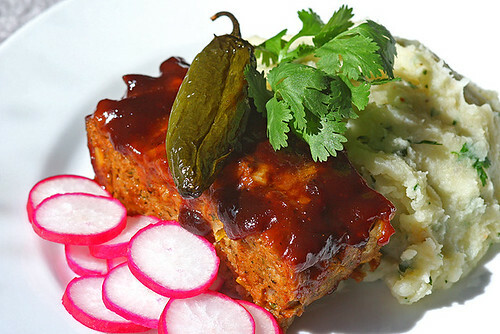 Transfer meatloaf to a meatloaf baking pan and smother evenly with the glaze. Pop in the oven for 1 hour. Meanwhile, start your mash by rinsing the cubed potatoes to get rid of excess starch. Place in a pot immersed in cold water and bring to a boil. Once boiling, reduce heat and continue boiling for another 20 minutes or until potatoes are tender enough to mash. Drain water and then, add butter, milk, salt & pepper and start mashing until smooth and creamy. Give it a taste and re-season accordingly. Add in cilantro and fold using a large spoon or spatula. Serve with slices of radish. I have finally discovered the joy of cilantro oil. Aaaahhhh!!!! Yeah, I know… I’ve been living in a cave! Although I have seen many recipes suggesting the use of neutral-flavored oil (canola, safflower, etc. 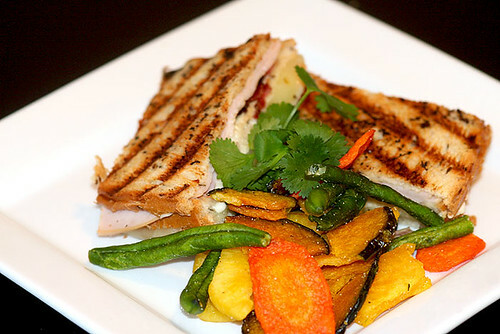 ), I prefer combining the pungent taste of coriander with the fruitiness of EVOO. I believe this combination allows for a bit more depth and complexity in flavor, especially when used in a naked pasta dish like this one. Also, you can strain the oil so that the solids are removed but I’d rather go rustic and leave everything mixed in. After all, it’s all about the cilantro, isn’t it? And remember to only make enough for each time you’ll use it since you want it as fresh as possible. 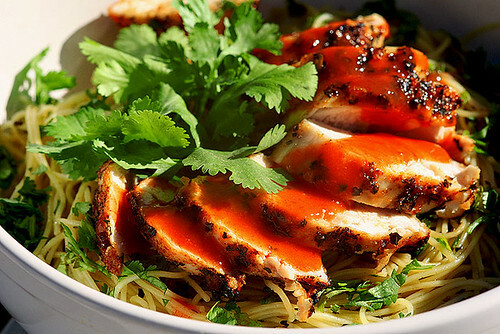 Now, if you’re a cilantro freak like I am, this dish will definitely put a smile on your face. And possibly, a few pounds more than you’d probably want. Make cilantro oil by combining one bunch of cilantro (don’t forget to reserve a few whole leaves for garnish later), EVOO and a pinch of salt in a food processor or blender and running it for a few minutes or until the mixture is completely liquefied. Store in fridge until ready to use. Strain it if you want or stir well before using. Rub chicken pieces with cilantro oil, season with salt & pepper and let it marinade for a few minutes in the fridge while you preheat the grill to 450F. Grill until done and set aside in a covered container. Meanwhile, cook the pasta to al dente. Drain the water afterwards then pour cilantro oil over until every piece of pasta is fully coated. Salt & pepper to taste and toss to combine. Plate the pasta. Top with slices of chicken pieces and if you want, drizzle a little hot sauce on top. Garnish with leftover whole cilantro leaves and maybe a lemon wedge, if you have it. Okay, no exact recipe here, folks. I just threw in whatever’s in the fridge and pantry. On this one, I mixed in finely chopped cilantro and bacon salt with olive oil mayonnaise and slathered it on 3 slices of dill rye. I slipped in a few turkey slices, 3 strips of turkey bacon, a couple slices of provolone and more whole cilantro leaves. Then I placed it on a panini grill pan in medium-low heat for about 3 minutes. And there you go. Now, do yours!